Hearing range describes the range of frequencies that can be heard by humans or other animals, though it can also refer to the range of levels. The human range is commonly given as 20 to 20,000 Hz, though there is considerable variation between individuals, especially at high frequencies, and a gradual loss of sensitivity to higher frequencies with age is considered normal. Sensitivity also varies with frequency, as shown by equal-loudness contours. Routine investigation for hearing loss usually involves an audiogram which shows threshold levels relative to a normal. Several animal species are able to hear frequencies well beyond the human hearing range. Some dolphins and bats, for example, can hear frequencies up to 100 kHz. Elephants can hear sounds at 14–16 Hz, while some whales can hear subsonic sounds as low as 7 Hz (in water). A basic measure of hearing is afforded by an audiogram: a graph of the minimum discernible sound level at various frequencies throughout an organism's nominal hearing range. Behavioural hearing tests or physiological tests can be used to find hearing thresholds of humans and other animals. For humans, the test involves tones being presented at specific frequencies (pitch) and intensities (loudness). When the subject hears the sound, he or she indicates it by raising a hand or pressing a button. The lowest intensity they can hear is recorded. The test varies for children; their response to the sound can be indicated by a turn of the head or using a toy. The child learns what to do upon hearing the sound, such as placing a toy man in a boat. A similar technique can be used when testing animals, where food is used as a reward for responding to the sound. Physiological tests do not need the patient to consciously respond. The information on different mammals' hearing was obtained primarily by behavioural hearing tests. Frequency is measured in hertz (Hz), the number of sound pressure level vibrations (sonic waves) per second. In humans, sound waves funnel into the ear via the external ear canal and reach the eardrum (tympanic membrane). The compression and rarefaction of these waves set this thin membrane in motion, causing sympathetic vibration through the middle ear bones (the ossicles: malleus, incus and stapes), the basilar fluid in the cochlea, and the hairs within it, called stereocilia. These hairs line the cochlea from base to apex, and the part stimulated and the intensity of stimulation gives an indication of the nature of the sound. Information gathered from the hair cells is sent via the auditory nerve for processing in the brain. 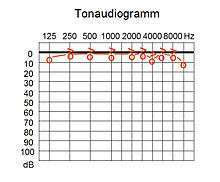 The commonly stated range of human hearing is 20 Hz to 20 kHz. [note 1] Under ideal laboratory conditions, humans can hear sound as low as 12 Hz and as high as 28 kHz, though the threshold increases sharply at 15 kHz in adults, corresponding to the last auditory channel of the cochlea. Humans are most sensitive to (i.e. able to discern at lowest intensity) frequencies between 2,000 and 5,000 Hz. Individual hearing range varies according to the general condition of a human's ears and nervous system. The range shrinks during life, usually beginning at around age of eight with the upper frequency limit being reduced. Women typically experience a lesser degree of hearing loss than men, with a later onset. Men have approximately 5 to 10 dB greater loss in the upper frequencies by age 40. An audiogram showing typical hearing variation from a standarized norm. Audiograms of human hearing are produced using an audiometer, which presents different frequencies to the subject, usually over calibrated headphones, at specified levels. The levels are weighted with frequency relative to a standard graph known as the minimum audibility curve, which is intended to represent "normal" hearing. The threshold of hearing is set at around 0 phon on the equal-loudness contours (i.e. 20 micropascals, approximately the quietest sound a young healthy human can detect), but is standardised in an ANSI standard to 1 kHz. Standards using different reference levels, give rise to differences in audiograms. The ASA-1951 standard, for example, used a level of 16.5 dB SPL (sound pressure level) at 1 kHz, whereas the later ANSI-1969/ISO-1963 standard uses 6.5 dB SPL, with a 10 dB correction applied for older people. Cats have excellent hearing and can detect an extremely broad range of frequencies, which is the range of about 10.5 octaves, one octave higher than dogs and 1.6 octaves higher than humans. They can hear higher-pitched sounds than either dogs or humans, detecting frequencies from 55 Hz up to 79 kHz (a range of 10.5 octaves) and dogs hear from 67 Hz to 45 kHz, a range of about 9 octaves. Cats do not use this ability to hear ultrasound for communication but it is probably important in hunting, since many species of rodents make ultrasonic calls. Cat hearing is also extremely sensitive and is among the best of any mammal, being most acute in the range of 500 Hz to 32 kHz. This sensitivity is further enhanced by the cat's large movable outer ears (their pinnae), which both amplify sounds and help a cat sense the direction from which a noise is coming. Cats' hearing also gets worse with age due to the frequent hearing of high pitched sounds. The hearing ability of a dog is dependent on breed and age, though the range of hearing is usually around 67 Hz to 45 kHz, which is a range of 9 octaves. (Humans hear a range of about 10 octaves.) As with humans, some dog breeds' hearing ranges narrow with age, such as the German shepherd and miniature poodle. When dogs hear a sound, they will move their ears towards it in order to maximise reception. In order to achieve this, the ears of a dog are controlled by at least 18 muscles, which allow the ears to tilt and rotate. The ear's shape also allows the sound to be heard more accurately. Many breeds often have upright and curved ears, which direct and amplify sounds. As dogs hear higher frequency sounds than humans, they have a different acoustic perception of the world. Sounds that seem loud to humans often emit high frequency tones that can scare away dogs. Whistles which emit ultrasonic sound, called dog whistles, are used in dog training, as a dog will respond much better to such levels. In the wild, dogs use their hearing capabilities to hunt and locate food. Domestic breeds are often used to guard property due to their increased hearing ability. So-called "Nelson" dog whistles generate sounds at frequencies higher than those audible to humans but well within the range of a dog's hearing. Bats have evolved very sensitive hearing to cope with their nocturnal activity. Their hearing range varies by species; at the lowest it can be 1 kHz for some species and for other species the highest reaches up to 200 kHz. Bats that can detect 200 kHz cannot hear very well below 10 kHz. In any case, the most sensitive range of bat hearing is narrower: about 15 kHz to 90 kHz. Bats navigate around objects and locate their prey using echolocation. A bat will produce a very loud, short sound and assess the echo when it bounces back. Bats hunt flying insects; these insects return a faint echo of the bat's call. The type of insect and how big it is can be determined by the quality of the echo and time it takes for the echo to rebound; there are two types; constant frequency (CF), and frequency modulated (FM) calls that descend in pitch Each type reveals different information; CF is used to detect an object, and FM is used to assess its distance. FM and CF are two different types of echo which inform the bat on the size and distance of the prey. The pulses of sound produced by the bat last only a few thousandths of a second; silences between the calls give time to listen for the information coming back in the form of an echo. Evidence suggests that bats use the change in pitch of sound produced via the Doppler effect to assess their flight speed in relation to objects around them. The information regarding size, shape and texture is built up to form a picture of their surroundings and the location of their prey. Using these factors a bat can successfully track change in movements and therefore hunt down their prey. Mice have large ears in comparison to their bodies. They hear higher frequencies than humans; their frequency range is 1 kHz to 70 kHz. They do not hear the lower frequencies that humans can; they communicate using high frequency noises some of which are inaudible by humans. The distress call of a young mouse can be produced at 40 kHz. The mice use their ability to produce sounds out of predators' frequency ranges: they can alert other mice of danger without also alerting the predator to their presence. The squeaks that humans can hear are lower in frequency and are used by the mouse to make longer distance calls, as low frequency sounds can travel farther than high frequency sounds. Hearing is birds' second most important sense and their ears are funnel-shaped to focus sound. The ears are located slightly behind and below the eyes, and they are covered with soft feathers – the auriculars – for protection. The shape of a bird's head can also affect its hearing, such as owls, whose facial discs help direct sound toward their ears. The hearing range of birds is most sensitive between 1 kHz and 4 kHz, but their full range is roughly similar to human hearing, with higher or lower limits depending on the bird species. "Birds are especially sensitive to pitch, tone and rhythm changes and use those variations to recognize other individual birds, even in a noisy flock. Birds also use different sounds, songs and calls in different situations, and recognizing the different noises is essential to determine if a call is warning of a predator, advertising a territorial claim or offering to share food." "Some birds, most notably oilbirds, also use echolocation, just as bats do. These birds live in caves and use their rapid chirps and clicks to navigate through dark caves where even sensitive vision may not be useful enough." As aquatic environments have very different physical properties than land environments, there are differences in how marine mammals hear compared to land mammals. The differences in auditory systems have led to extensive research on aquatic mammals, specifically on dolphins. The auditory system of a land mammal typically works via the transfer of sound waves through the ear canals. Ear canals in seals, sea lions, and walruses are similar to those of land mammals and may function the same way. In whales and dolphins, it is not entirely clear how sound is propagated to the ear, but some studies strongly suggest that sound is channeled to the ear by tissues in the area of the lower jaw. One group of whales, the Odontocetes (toothed whales), use echolocation to determine the position of objects such as prey. The toothed whales are also unusual in that the ears are separated from the skull and placed well apart, which assists them with localizing sounds, an important element for echolocation. Studies have found there to be two different types of cochlea in the dolphin population. Type I has been found in the Amazon river dolphin and harbour porpoises. These types of dolphin use extremely high frequency signals for echolocation. Harbour porpoise emits sounds at two bands, one at 2 kHz and one above 110 kHz. The cochlea in these dolphins is specialised to accommodate extreme high frequency sounds and is extremely narrow at the base of the cochlea. Type II cochlea are found primarily in offshore and open water species of whales, such as the bottlenose dolphin. The sounds produced by bottlenose dolphins are lower in frequency and range typically between 75 to 150,000 Hz. The higher frequencies in this range are also used for echolocation and the lower frequencies are commonly associated with social interaction as the signals travel much farther distances. Marine mammals use vocalisations in many different ways. 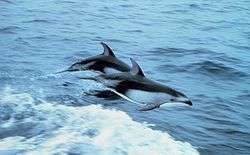 Dolphins communicate via clicks and whistles, and whales use low frequency moans or pulse signals. Each signal varies in terms of frequency and different signals are used to communicate different aspects. In dolphins, echolocation is used in order to detect and characterize objects and whistles are used in sociable herds as identification and communication devices. ↑ which corresponds to sound waves in air at 20°C with wavelengths of 17 meters to 1.7 cm (56 ft to 0.7 inch). ↑ Marler, Peter (2004). Nature's Music: The Science of Birdsong. Academic Press Inc. p. 207. ISBN 978-0124730700. ↑ Katz, Jack (2002). Handbook of Clinical Audiology (5th ed.). Philadelphia: Lippincott Williams & Wilkins. ISBN 9780683307658. RR Fay. 1988. Hearing in Vertebrates: a Psychophysics Databook. Hill-Fay Associates, Winnetka IL. D Warfield. 1973. The study of hearing in animals. In: W Gay, ed., Methods of Animal Experimentation, IV. Academic Press, London, pp 43-143. RR Fay and AN Popper, eds. 1994. Comparative Hearing: Mammals. Springer Handbook of Auditory Research Series. Springer-Verlag, NY. CD West. 1985. The relationship of the spiral turns of the cochela and the length of the basilar membrane to the range of audible frequencies in ground dwelling mammals. Journal of the Acoustic Society of America 77:1091-1101. EA Lipman and JR Grassi. 1942. Comparative auditory sensitivity of man and dog. Amer J Psychol 55:84-89. HE Heffner. 1983. Hearing in large and small dogs: Absolute thresholds and size of the tympanic membrane. Behav Neurosci 97:310-318. ↑ Rossing, Thomas (2007). Springer Handbook of Acoustics. Springer. pp. 747, 748. ISBN 978-0387304465. ↑ Olson, Harry F. (1967). Music, Physics and Engineering. Dover Publications. p. 249. ISBN 0-486-21769-8. Under very favorable conditions most individuals can obtain tonal characteristics as low as 12 cycles. ↑ Ashihara, Kaoru (2007-09-01). "Hearing thresholds for pure tones above 16kHz". The Journal of the Acoustical Society of America. 122 (3): EL52–EL57. doi:10.1121/1.2761883. ISSN 0001-4966. The absolute threshold usually starts to increase sharply when the signal frequency exceeds about 15 kHz. ... The present results show that some humans can perceive tones up to at least 28 kHz when their level exceeds about 100 dB SPL. ↑ Dittmar, Tim (2011). Audio Engineering 101: A Beginner's Guide to Music Production. Taylor & Francis. p. 17. ISBN 9780240819150. ↑ Moller, Aage R. (2006). Hearing: Anatomy, Physiology, and Disorders of the Auditory System (2 ed.). Academic Press. p. 217. ISBN 9780080463841. ↑ Gelfand, S A., 1990. Hearing: An introduction to psychological and physiological acoustics. 2nd edition. New York and Basel: Marcel Dekker, Inc.
↑ Sataloff, Robert Thayer; Sataloff, Joseph (February 17, 1993). Hearing loss (3rd ed.). Dekker. ISBN 9780824790417. 1 2 3 Condon, Timothy (2003). Elert, Glenn, ed. "Frequency Range of Dog Hearing". The Physics Factbook. Retrieved 2008-10-22. 1 2 Heffner, Rickye S. (November 2004). "Primate Hearing from a Mammalian Perspective" (PDF). The Anatomical Record Part A: Discoveries in Molecular, Cellular, and Evolutionary Biology. 281 (1): 1111–1122. doi:10.1002/ar.a.20117. PMID 15472899. Retrieved 20 August 2009. ↑ Heffner, Henry E. (May 1998). "Auditory Awareness". Applied Animal Behaviour Science. 57 (3–4): 259–268. doi:10.1016/S0168-1591(98)00101-4. 1 2 Sunquist, Melvin E.; Sunquist, Fiona (2002). Wild Cats of the World. University of Chicago Press. p. 10. ISBN 0-226-77999-8. ↑ Blumberg, M. S. (1992). "Rodent ultrasonic short calls: locomotion, biomechanics, and communication". Journal of Comparative Psychology. 106 (4): 360–365. doi:10.1037/0735-7036.106.4.360. PMID 1451418. ↑ Heffner, Rickye S. (1985). "Hearing Range of the Domestic Cat" (PDF). Hearing Research. 19: 85–88. doi:10.1016/0378-5955(85)90100-5. PMID 4066516. Retrieved 20 August 2009. 1 2 Hungerford, Laura. "Dog Hearing". NEWTON, Ask a Scientist. University of Nebraska. Retrieved 2008-10-22. 1 2 Adams, Rick A.; Pedersen, Scott C. (2000). Ontogeny, Functional Ecology, and Evolution of Bats. Cambridge University Press. pp. 139–140. ISBN 0521626323. ↑ Bennu, Devorah A. N. (2001-10-10). "The Night is Alive With the Sound of Echoes". Archived from the original on 2007-09-21. Retrieved 2012-02-04. ↑ Richardson, Phil. "The Secret Life of Bats". Archived from the original on 2011-06-08. Retrieved 2012-02-04. ↑ Lawlor, Monika. "A Home For A Mouse". Society & Animals. 8. Archived from the original on 2012-10-13. Retrieved 2012-02-04. ↑ Beason, C., Robert. "What Can Birds Hear?". USDA National Wildlife Research Center - Staff Publications. Retrieved 2013-05-02. 1 2 Mayntz, Melissa. "Bird Senses – How Birds Use Their 5 Senses". Birding / Wild Birds. About.com. Retrieved 2012-02-04. ↑ Ketten, D. R.; Wartzok, D. Thomas, J.; Kastelein, R., eds. "Three-Dimensional Reconstructions of the Dolphin Ear" (PDF). Sensory Abilities of Cetaceans: Field and Laboratory Evidence. Plenum Press. 196: 81–105. doi:10.1007/978-1-4899-0858-2_6. Archived from the original (PDF) on 2010-07-30. D'Ambrose, Chris (2003). "Frequency Range of Human Hearing". The Physics Factbook. Retrieved 2007-02-28. Hoelzel, A. Rus, ed. (2002). Marine Mammal Biology: An Evolutionary Approach. Oxford: Blackwell Science. ISBN 9780632052325. Ketten, D. R. (2000). "Cetacean Ears". In Au, W. L.; Popper, Arthur N.; Fay, Richard R. Hearing by Whales and Dolphins. New York: Springer. pp. 43–108. ISBN 9780387949062. Richardson, W. John (1998). Marine mammals and noise. London: Academic Press. Rubel, Edwin W.; Popper, Arthur N.; Fay, Richard R. (1998). Development of the auditory system. New York: Springer. ISBN 9780387949840.